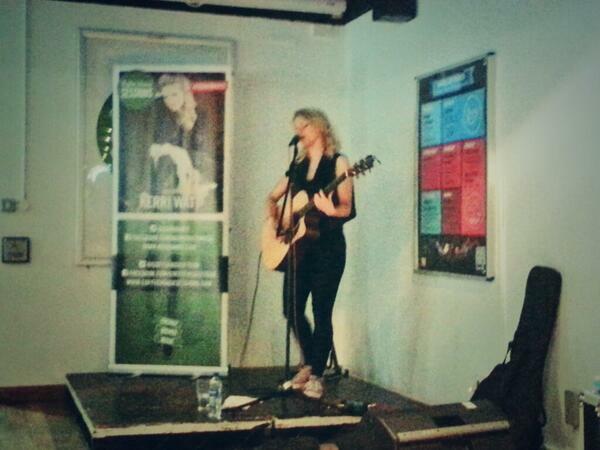 Home » Lifestyle » Kerri Watt plays the Coffee House Sessions. Serving of the success of last weeks Coffee House Session with Ben Goddard, we have been blessed with a second helping, Kerri Watt. The Coffee House Sessions is a set of two tours curated by Radio 1’s very own Huw Stephens. Consisting of forty universities, an artist will visit two universities a day for ten days! UWE is fortunate enough to be on the path of one of these tours, bringing us some incredible talent to the Escape bar on Frenchay Campus. Kerri Watt stole the stage in this week’s round of coffee, with her pure and powerful range of vocals she opened her set with a very original “soulful, country, pop” track of her own named ‘Let it Flow’. Dropping down the pace into a beautiful blues song named ‘Little Sally’ she had won the crowd. Without knowing it, people started to find their feet tapping along. After she had our ears, and our feet, she continued to win our hearts. With a cover of Bob Dylan’s ‘Don’t Think Twice’, I think she may have achieved that. Dedicating the next selection of songs in her set to her travels through California, she began with ‘Queen of California’ by John Mayer, one of her greatest influences. Continuing with her California themed songs she went into an original song her hers ‘California Heart’. With this song you could really see she was getting into her stride, her passion for music really shone through her. She finished the set with ‘Maybe’ another original song of hers. This smooth and captivating track is due to release early next year and I’m sure it’ll be stuck on repeat, there’s no ‘maybe’ about it. But acting is not Kerri’s only other talent, when discussing what she does outside of her musical life I discovered another skillset. Pumpkin Carving. A convenient skillset seeing as we’ve just hit the month of October, “I’ll spend the rest of the month carving pumpkins for sure. I love pumpkin carving,” she told me. When she’s not carving pumpkins she’s stargazing, “astronomy is my hobby”, she expressed. But that’s not the only stargazing she does. “My weekend off from the tour I drove all the way from London back to Glasgow just so that I can go to a Rod Stewart gig,” Kerri explained that music was “not really work for me, it’s my passion” and so she also spends her spare time listening to music and going to gigs.